Deal Special damage to target enemy. Target Lock: Inflict Critical Damage Down on target enemy for 2 turns. Dispel all debuffs on the Emperor's Shuttle any time it takes damage from a Target Locked enemy. Empire and Sith allies gain Protection Up (20%) for 2 turns when critically hit, doubled to 40% for Empire or Sith allies that are Taunting. 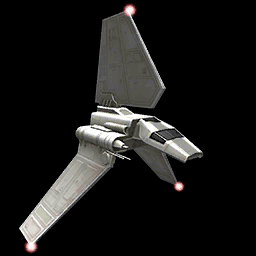 Enter Battle: The Emperor's Shuttle gains Protection Up (25%) and Critical Hit Immunity for 2 turns. Empire and Sith allies gain Offense Up for 2 turns. Inflict Tenacity Down on target enemy for 2 turns, which can't be evaded or resisted. The Emperor's Shuttle can use Emperor's Influence immediately. Dispel all debuffs from target Empire or Sith ally, then they recover 50% of their Max Health and Protection. Dispel all buffs from target enemy and inflict Buff Immunity on all Target Locked enemies for 2 turns. This ability starts on cooldown and can't be evaded. Deal Special damage to target enemy and inflict Target Lock on them for 2 turns. Then, the healthiest other Empire or Sith ally Taunts for 2 turns.